Close-up on the Japanese "New Wave"
While Mongolian Yokozuna Asashoryu reigns supreme and another Mongolian might contest his dominance, the symbolic Japanese sport of sumo is continuing to decline in popularity at home. That could very soon change with the arrival of a new generation of very talented young Japanese wrestlers. Before they reach top billing we are going to present to you, via a series of articles, this new Japanese wave which could crash ashore. Come find out! At the Haru basho a new sekitori started in the makuuchi division: he was Tochiozan, a student of Kasugano-beya, known not long ago under the shikona of Kageyama. This promotion is notable for its speed worthy of the great wrestlers, just as his arrival in the juryo division was at the time. Moreover Tochiozan achieved a very brilliant Haru basho, which merited his first sansho. At this key moment in his career, which many predict will be exceptional, we offer you a provisional assessment of the already remarkable progress of Tochiozan's career as well as an interview which he gave to a daily newspaper in his home area. When he joins Kasugano-beya at the end of 2004, Yuichiro Kageyama is a 17-year-old teenager still wearing his school uniform. This uniform is that of Meitoku Gijuku high school in Susaki, Kochi prefecture. 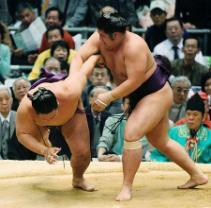 Yuichiro Kageyama is the 13th pupil of that establishment to enter professional sumo. Among his seniors currently active is the current Yokozuna Asashoryu, along with Asasekiryu and Kotoshogiku. When his entry into professional sumo is announced, Kageyama says: "I am delighted to join this stable and to be able to put my strength to the test as I have wanted. I want to become a sekitori very fast and to tread on the same dohyo as my senior Kotoshogiku (ed: from the same college)." Kasugano Oyakata also displays great optimism: "I now have responsibility for an athlete with a very promising future. He will surely become one of the wrestlers on which the stable will depend. I want him to develop his unique brand of offensive sumo." Kageyama measures 186 cm and weighs 140 kg. He passes his medical examination at the Hatsu Basho 2005 where he makes his debut in maezumo. If, on his entry to Kasugano-beya, Kageyama is new in the world of professional sumo, his name is already known by specialists and amateurs and his list of prizes has begun to fill with prestigious titles since school. At this time, Yuichiro still lives in Aki, a town in Kochi prefecture, on the south side of the island of Shikoku. 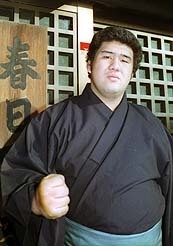 In 2001 at the National College Championships, he wins the individual title (College Yokozuna) as well as the team title. This event will suggest to him the idea of becoming professional. In April 2002 he enters Meitoku college and the following year he wins the team title at the National College Championships. It is thus rather natural that at the end of 2004, in his last year at school, he commits to professional sumo, preceding the traditional mass of new recruits straight from school who arrive in March at the end of the academic year. The maezumo tournament is a formality from which he emerges undefeated and which wins him a good rank at jonokuchi 31 east. His first combat leaves a bitter taste in one's mouth. He is up against jonokuchi 31 west Sawai (the future Goeido), also unbeaten in the maezumo tournament. Sawai is a rival with whom he has been rubbing shoulders for a long time at the highest level and who has had the better of him up to now. And once again Kageyama is beaten. He analyses his loss, "I wanted to get into his right but I launched myself in too much of a hurry." and cannot believe it. This first bout will not otherwise turn out to be significant for the future. His progress through the Minarai divisions will not pose any problems for Kageyama. He spends nine tournaments there, winning a zensho yusho in the sandanme division on the way at the Kyushu basho in 2005. Before entering the antechamber of champions, the cruel makushita division, where destiny is made and broken, his reputation is already made. His sumo is of a purely offensive style. Right from the tachi-ai he powerfully seeks to get his right hand under the arm of his opponent in order to seize his mawashi. It is the "migi-yotsu" style and Kitanoumi rijicho, who was a master at it, recognizes it and observes that the new boy is good. Of course the apprentice can still improve and his weak point comes from his main strength. The fact is that Kageyama never moves backwards and doesn't know how. All his creativity and his technique are used in offence. So when he comes up against a talented opponent who is as powerful or more powerful than he is, if he finds himself on the defensive then he becomes weak, much too weak. Those who know him are aware of this Achilles' heel and attempt to take advantage of it. Among them is Sawai, the same person Kageyama has been unable to defeat in either of their two combats in the lower divisions. By his own admission, on their entrance into sumo, Kageyama was a little upset to see all the attention concentrated on Sawai. But he realises that his presence has become a stimulus. Despite the speed of his progress, Kageyama is disappointed not to have been promoted to juryo after just eight tournaments, after the Natsu basho in 2006. He began this tournament at makushita 3 and finished with a score of 5-2, normally enough for promotion. He will be ranked makushita 1 at the Nagoya Basho and will be even more motivated to clinch his promotion rapidly with an almost perfect score of 6-1. His career record before becoming sekitori is more than flattering with 50 wins against 13 losses. Only 12 wrestlers of the 57 he has faced have been able to hold him back. Another remarkable fact is that he has no make-koshi against him! 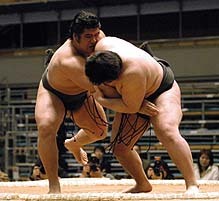 Kageyama is therefore promoted to juryo in the Aki basho of 2006 (MDS 17, pp. 23-24) and on this occasion has a change of shikona: from now on he will be known as Tochiozan. "This shikona holds within it the idea of arriving at the peak of a mountain. It's up to me alone to make my name grow or else to leave it to stagnate." Including maezumo, it will have taken him only 10 tournaments to arrive in juryo, which puts him in ninth place on the list of the fastest ascents to this division. He also leaves behind him Sawai, his long-term rival. 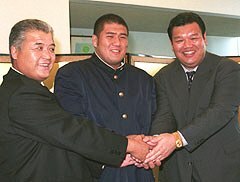 The latter had initially surpassed him, particularly in thanks to a zensho yusho at the Nagoya basho of 2005, which enabled him to reach the makushita division. Tochiozan welcomes his promotion, quietly happy: "When I made my debut, I expected to become sekitori within three years. I can therefore consider that things have gone well." He also analyses his own sumo: "My tachi-ai is still weak." He also expresses his wish to keep his offensive sumo style, "If my opponent pushes then I will push him. If my opponent wants to penetrate my defences then I will penetrate his defences. In any case I won't stop." But he also talks of his ambitions: "I want to become sekitori as quickly as possible and face my seniors from Meitoku. And if possible I want to become Yokozuna - yes, I want to get to that rank quickly." Kasugano oyakata sets for him some shorter-term objectives: "In the Nagoya basho he showed real offensive power. I hope he continues to work hard and gradually reaches the ranks of ozeki and yokozuna. But first of all he must achieve his 10th kachi-koshi in the next tournament." Tochiozan must maintain the rhythm adopted by him as Kageyama and continue not to waste time. After three rather low key tournaments he achieves his promotion to the top division. The banzuke for the Haru basho of 2007 is published on the 26th February and confirms the promotion of Tochiozan, now sekitori. The speed with which he has achieved the stages towards the makuuchi division creates a buzz. Just as on his accession to the juryo division, he is in ninth place for the most rapid ascent (PBI 20, p.11). He is able to celebrate his 20th birthday fittingly several days before the Spring Tournament. Tochiozan's record is still clean of any make-koshi, and his offensive sumo is much noticed. He is "the wrestler who never moves backwards". In this situation, many eyes are on him this March 2007. Tochiozan's prestigious reputation certainly precedes him, but how will he behave against the best in the game? The young sekitori from Kasugano beya will not leave us wondering for long. As far as technique is concerned, he remains faithful to his offensive type of migi-yotsu sumo. In the matter of scores, his card has been positive since the third day and will remain so until the end. He achieves his kachi-koshi on the 10th day, and double digits on the 12th and crowns his success by finishing 11-4. On the way Tochiozan will have met and notably beaten Kokkai, Takamisakari and Homasho. On the other hand he will have been beaten by Roho and sekiwake Kotomitsuki. Such an entrance into the courts of the great could not remain without consequence and Tochiozan wins his first sansho, the fighting spirit prize, the technique prize having gone to Homasho. At the start of his first tournament in the makuuchi division, Tochiozan didn't disappoint the hopes placed in him. Those who can already imagine him bearing the tsuna can continue to hope, he himself most of all. 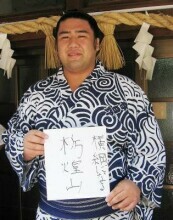 After his impressive Haru Basho, Tochiozan went home to the Kochi region where he was suitably feted. During this trip home, he granted an interview to Kochi Shimbun newspaper, a local daily. Here is a translation. Tochiozan, who finishes the Haru basho (his first tournament in makuuchi) with 11 wins and the fighting spirit prize (kantosho), has returned to Aki, where his family home is. On 28th March, he visited Kochi Shimbun. Tochiozan: I didn't think I'd have such a good tournament. My legs moved well and I have gained self-confidence. I want to improve my offensive sumo even more so that I can get another kachi-koshi at the Natsu basho and reach a higher rank. Kochi Shimbun: Since your debut, you haven't had a single make-koshi, you spent only three tournaments in juryo, and you starred in your first tournament in makuuchi. Tochiozan: I trained in my stable, but wrestlers from other stables also came to train there. In that way I am able to enrich my sumo. I started this tournament like all the others, telling myself from the first day, "Don't think too much and concentrate first of all on the kachi-koshi." KS: At the start of the tournament, you were at 3-2. You easily beat former sekiwake Wakanosato but you lost to veteran Tokitsuumi by letting him get you into yotsu-zumo. Tochiozan: I was able to react to Wakanosato's sumo. But Tokitsuumi grabbed my body suddenly at the tachi-ai and then took control of the bout. Even if I could have grabbed his mawashi first, in makuuchi all opponents are talented. I just said to myself "Go forward without asking yourself too many questions. You have no choice but to continue with your offensive sumo." KS: From the sixth day on, you won seven in a row. On the 12th day you were only one loss behind Hakuho and right from the tachi-ai you crushed Homasho, a rising talent. Tochiozan: I wasn't thinking about the yusho race. Homasho's sumo is excellent; he is solid on his legs. But I said to myself that if he used only his strength, I was perhaps better than him. I'm not the type to do tricks at the tachi-ai, so I just forged ahead. I have fought some good bouts this tournament but that one leaves a particular mark on me. KS: Since the move to six tournaments per year (in 1958), you are the first new promotee to have been in a position to win the yusho. But on the 13th and 14th day you lost against the "famous" Roho and Kotomitsuki. Tochiozan: I knew about the slaps (harite) that Roho inflicts on you at the tachi-ai, because I have already experienced them in training. But nevertheless he imposed his own rhythm on me, and I wasn't able to do the tachi-ai my way. So I was dispatched. Tochiozan: At that level, everyone has his own style. I know that I will have to deal with tachi-ai that are much more difficult to manage, that I will have to absorb slaps and give up an inside mawashi grip much more often, but I want to be able to handle that. Whether it is yotsu-zumo, or even ottsuke (see glossary), there are many things that I must improve. But even so I think it would be bad for me to become defensive. Yotsu-zumo also means pushing back short opponents to prevent them from penetrating your defences. 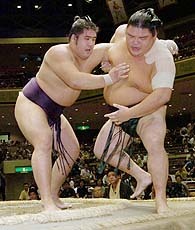 Whatever happens, I want to devote myself to perfecting an unstoppable sumo. I want to beat my seniors Toyonoshima and Kotoshogiku and also Kisenosato, who is about my age. Juryo and lower (minarai) divisions records (losses in purple, higher ranked opponents in green).